"My brother said to me ... 'If You shut your eyes to a frightening sight, You end up being frightened. If You look at everything straight on, there is nothing to be afraid of.'" - Kurosawa, A. : Something Like an Autobiography, 1983. The more one studies Tibet, the clearer its complexity becomes. Just like the uncorrupted Pyramid Texts of Unas, the much larger corpus of millennia old Buddhist material preserved by Tibetan Lamaism is remarkable and contains a multitude of skillful methods and profound insights into the ultimate nature of phenomena, the wisdom of the Buddha apprehending emptiness. The legitimacy of this Communist invasion can and should be questioned, criticized and rejected. Nor can the old political connections between pre-Communist China and Tibet be overlooked. Obviously, nothing condones the violence with which Communist China tried to so-call "liberate" Tibet. Nor does it justify the Chinese claim Tibet was always part of China, which is obviously not the case. In fact, at the time when Tibet was overrun by Communist China, Tibet was actually independent ! Let us consider the political fact-line. "The Great King of Tibet, the Miraculous Divine Lord, and the Great King of China, the Chinese Ruler Hwang-ti, being in the relationship of nephew and uncle, have conferred together for the alliance of their kingdoms. They have made and ratified a great agreement. Gods and men all know it and bear witness so that it may never be changed ; and an account of the agreement has been engraved on this stone pillar to inform future ages and generations. The Miraculous Divine Lord Tri-tsug De-tseji and the Chinese King Wen Wu Hsiao-te Wang-ti, nephew and uncle, seeking in their far-reaching wisdom to prevent all causes of harm to the welfare of their countries now or in the future, have extended their benevolence impartially over all. With the single desire of acting for the peace and benefit of all their subjects they have agreed on high purpose of ensuring lasting good ; and they have made this great treaty in order to fulfil their decision to restore the former ancient friendship and mutual regard and the old relationship of friendly neighbourliness. Between the two countries no smoke nor dust shall be seen. There shall be no sudden alarms and the very word 'enemy' shall not be spoken. Even the frontier guards shall have no anxiety nor fear and shall enjoy land and bed at their ease. All shall live in peace and share the blessing of happiness for ten thousand years. The fame of this shall extend to all places reached by the Sun and the Moon. This solemn agreement has established a great epoch when Tibetans shall be happy in the land of Tibet, and Chinese in the land of China. So that it may never be changed, the Three Precious Jewels of Religion, the Assembly of Saints, the Sun and Moon, Planets and Stars have been invoked as witnesses. An oath bas been taken with solemn words and with the sacrifice of animals ; and the agreement has been ratified. If the parties do not act in accordance with this agreement or if they violate it, whichever it be, Tibet or China, nothing that the other party may do by way of retaliation shall be considered a breach of the treaty on their part. The Kings and Ministers of Tibet and China have taken the prescribed oath to this effect and the agreement has been written in detail. The two Kings have affixed their seals. The Ministers specially empowered to execute the agreement have inscribed their signatures and copies have been deposited in the royal records of each party. Tibet and China shall abide by the frontiers of which they are now in occupation. All to the east is the country of Great China ; and all to the west is, without question, the country of Great Tibet. Henceforth on neither side shall there be waging of war nor seizing of territory. If any person incurs suspicion he shall be arrested ; his business shall be inquired into and he shall be escorted back. Now that the two kingdoms have been allied by this great treaty it is necessary that messengers should once again be sent by the old route to maintain communications and carry the exchange of friendly messages regarding the harmonious relations between the Nephew and Uncle. According to the old custom, horses shall be changed at the foot of the Chiang Chun pass, the frontier between Tibet and China. At the Suiyung barrier the Chinese shall meet Tibetan envoys and provide them with all facilities from there onwards. At Ch'ing-shui the Tibetans shall meet Chinese envoys and provide all facilities. On both sides they shall be treated with customary honour and respect in conformity with the friendly relations between Nephew and Uncle." When the last Emperor of Tibet died (Lang Darma in 842), the empire fell apart. The fundamental & radical conflict between native Shamanism (Bön) and Buddhist Lamaism had led to violent tensions and a drastic split between, on the one hand, royals, aristocrats and leading Lamas adhering to Buddhism and, on the other hand, those adhering to the native Bön, safeguarding their own local authority against any central power. The conflict between Buddhism & Bön had been there from the start (cf. Padmasambhava's role, from 763 onwards, in binding the "evil spirits"). As soon as Lang Darma was enthroned, he turned against the monastics. For a century, Buddhism was eradicated in Middle Tibet. This period is called the "dark age" or the "age of fragmentation". "This may have been a dark age -the light of the dharma may have gone out- from the perspective of monastic institutions and centralized authority, but it was no time of stagnation and decay. In fact, the institutional darkness of the age and its remarkable creativity were two sides of the same coin. The political fragmentation of Tibet was precisely what allowed the populace to make Buddhism their own, freed from the controls of a centralized monastic authority." - Dalton, 2011, p.13. In the 11th century, the Dharma of Lord Buddha was reintroduced. 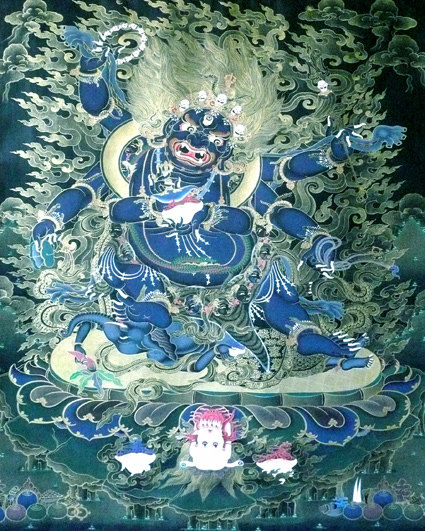 Initiated by the "old" Nyingma school of Padmasambhava, the Dharma had been at war with Bön, hiding from the nobility. With the murder of Lang Darma by a Buddhist monk, three centuries of strong central authority ended. The Buddhadharma had strived and, at the end, encountered oppositions from within the Tibetan mentality (Bön). For more than a century after Lang Darma's death, international exchanges were absent. Tibet fell apart and internal wars between monasteries & their wealthy patrons were ongoing. From the 10th century onward, Tibet was a tapestry of monasteries, nomads & nobles seeking no unified authority. This regionalism, both spiritually as culturally, initiated fractional, tribal & violent geosentimental divisions lasting for over three centuries. After having found ample sources in the North of India, many new Tibetan schools saw the light. They appeared and ceased, but four great lineages endured : "Kadam" (Atiśa), "Sakya" (Sakya Pandita) & "Kagyu" (Milarepa), and of course the "Old Translation" Nyingmapas. The presence of these early schools of Tibetan Buddhism, each with their own focus and points of attention, as well as the divisions between powerful, wealthy chieftains sponsoring the monasteries (while later, the rich monasteries backed the aristocrats), divided Tibet politically. This lasted until 1268, when Tibet became part of the Mongol Empire. At this point, fractions were united by superior force. The Mongol Empire was created by Djingis Khan (1155/1162/1167 - 1227) and his 125.000 "nomadic barbarians". It exceeded the Roman Empire. Between 1207 and 1215, he subdued the kingdoms on his southern borders : Ujgurs, Tangut & Jin. For the moment, the Song Chinese, proud & strong, were left alone. Until his death, Djingis Khan conquered a vast territory West of China, including Iran, Afghanistan, Kazachstan, Turkmenistan, parts of Turkey, Armenia, Azerbeidzjan and large parts of Russia & Europe. In 1240, Djingis Khan's grandchild, Godan Khan, dispatched a small army to Tibet. It encountered little resistance, killed 500 Tibetans, ransacked several monasteries and left. But during their raids, their commanding officer got fascinated by Buddhism and the spiritual powers of the Lamas. In 1247, the monk Sakya Pandita became Godan Khan's teacher. When later Kublai Khan (1215 - 1294) became prominent, he also showed interest in Buddhism and was taught by Sakya Pandita's nephew, Phagpa Gyaltsen. When he became the "Great Khan" (in 1260), Phagpa became his imperial teacher. In 1268, three years after Phagpa was send back to Tibet to be installed as the Mongol vazal or vice-king of Tibet, the Mongols established their rule in Tibet and erected the administrative system. In that same year, the alphabet developed by Phagpa, devoid of Chinese characters, became the official writing of the Mongol Empire (it remained in use for 110 years). The Mongols began conquering the Song Chinese only as late as 1258, but because of the fierce resistence, this took more than two decades. In 1271, Kublai Khan named his own dynasty, the "Yuan", completing the destruction of the Song Chinese in 1279. The "Yuan" Dynasty was Mongol, not Chinese. Kublai Chan tried to separate both and his Forbidden City was intended to do just that. As a Mongol enclave in Beijing, its access was forbidden to the native Chinese ! Despite propaganda, the Mongols first subdued Tibet (1268) and then the Song Chinese (1279). So at the time when Tibet actually became a vazal of the Mongol Empire, the Song Chinese were still independent. The Mongols ruled both countries independently from each other and treated both in a different way, underlining their cultural autonomy. The Mongols, establishing "khanates" in both China & Tibet, did not establish Chinese authority over Tibet, although they brought both together under one rule. So it is not the case that Tibet became part of the Chinese Yuan Dynasty ! The Mongols ruled both the Tibetans & the former Song Chinese. In 1368, the latter drove the Mongols beyond the Great Wall and initiated the Ming Dynasty. Meanwhile, in 1352, Changchub Gyaltsen rejected the Sakya Dynasty installed by Kublai Khan in Tibet. In 1358, he was accepted by the Mongols as the new vice-king, but he soon replaced Sakya-officials loyal to the Mongols. The dream of a "Tibetan Empire" never vanished. He died in 1364 and his nephew headed the so-called "Phamo Drupa-reign" or Gyaltsen Dynasty. In 1368, Tibet rejected any connection with the Mongols and became again independent. This is an important moment. Seeking a strong protector is not the same as having to obey the protector. Suzerainity is not the same as sovereignty. In matters of independence, Tibet identifies itself as a nation, but once independent succumbs (again) to its fractions. At the end of the Phamo Drupa-reign (ca. 1434), a new fraction rose in power. This Rinpung fraction of kings backed the Red Hat Kagyupas and in ca.1500 this school found reasons to curtail the power of the fast growing Yellow Hat Gelugpas, the new Kadampas initiated by Tsongkhapa (1357 - 1419). Kagyu monks ransacked Gelug monasteries and destroyed them. From 1450 onwards, Tibetan fractions were constantly at war. In 1565, Tsang kings supporting the Kagyupas take over political power in Middle Tibet. The chaos was complete. The Tibetans, despite Lamaism & the constant building of monasteries, were unable to unite ! Between the Mongols, conflicts were also unending. Although not a "Great Khan" or Emperor, Atlan Khan (1543 - 1583) was the most prominent leader of his time. He ransacked Chinese cities, and in 1550 burned the outer quaters of Beijing. In 1571, he signed a treaty with the Ming Emperor. Atlan Khan was not one of the loyal subjects of the Chinese Emperor, but wanted to be treated as an equal. When Atlan Khan heard of Sonam Gyatzo, the head Lama of the Gelug school, he wanted to meet him. In June 1578, both men met and exchanged honorary titles. Atlan Khan translated "Sonam" (meaning "virtue") "Gyatzo" (meaning "ocean" or "dalai") as "Ocean of Virtue". The full title he gave was : "Delightful Vajradhara, excellent & brilliant Ocean of Virtue". As "Lama" was an honorary title for reincarnated teachers ("tulkus"), the title "Dalai Lama" or "Ocean Teacher" was coined. "Gyatzo" or "ocean" remained the last name of all Dalai Lamas. Sonam Gyatzo became the IIIth Dalai Lama (he died in 1588), while the Ith and IIth Dalai Lamas received this title posthumously (the First was a pupil of Tsongkhapa, the founder of the Gelug Order). Just like Phagpa Gyaltsen before him, Sonam Gyatzo became the teacher of Atlan Khan. Within half a century, nearly all Mongols had become Buddhists, and thousands of monks lived in Mongol monasteries. The Mongols were very loyal Gelugpas, who venerated the Dalai Lama as the foremost of the Lamas. Thanks to the Mongols, the institution of the Dalai Lama became extremely powerful in Tibet, while the Gelug became the most prominent school of the land. What a great opportunity for Tibetan Lamaism to enter its "classical period". Conveniently, in 1589, the IVth Dalai Lama reincarnated as the great grandchild of Atlan Khan. It was the first time a manifestation of Avalokiteśvara was born in a non-Tibetan, a Mongolian boy called "Yonten Gyatzo". The East Mongols, who accompanied him to Lhasa, stayed there to protect him, for the conflict between Kagyu & Gelug and their wealthy noble patrons was still very much alive. In 1605, the army of nobles, defending the Kagyu-school, drove the Mongols out, but they returned in 1619. The tensions between the Mongol-backed Gelugpas and the Kagyupas endorsed by the wealthy were ongoing. These cultural differences also reflect in the teachings and the mode of transmission. The East Mongols were increasingly unable to help the Dalai Lamas. In 1617, the IVth Dalai Lama died, and some say he was poisoned. Lobsang Gyatzo, the Vth Dalai Lama, the so-called "Great Fifth", was born in the same year. His father belonged to the Nyingmas, who are not celebate. Despite the institution of the Dalai Lama, the conflict with the Kagyupas & their protectors continued. 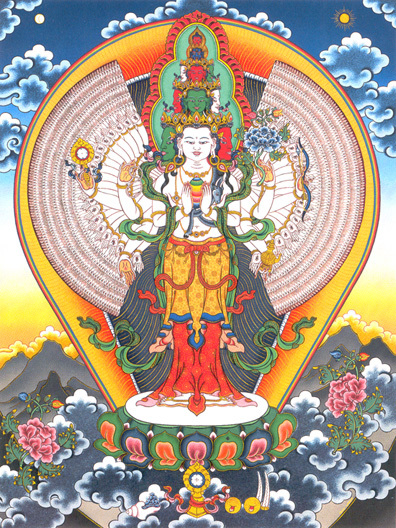 The Great Fifth studied the teachings of the Nyingma, Sakya & Gelug schools. The king of Tsang (in Shigatse) formed an alliance with the Kagyupas, who violently opposed the Dalai Lama. This lineage remained foreign to him. As the West Mongols were on the rise, Goesjri Khan, a king of the Kosjot-Mongols, was asked by the regent, Sonam Rapten, to protect the Vth Dalai Lama (1617 - 1682). Help was needed, for the intense & violent conflict between Gelug & Kagyu split the country. Ironically, the East Mongols now took sides with the king of Tsang & the Kagyupas. So the West Mongol king Goesjri Khan had to fight Mongols who had supported the IIIth Dalai Lama ! It took three years before Goesjri Khan could install the Vth Dalai Lama as the head of a united Tibet. In 1642, the king of Tsang was killed and the Great Fifth went to Shigatse to sit on his throne, with Goesjri Khan and Sonam Rapten on both sides. This Enthronement Scene has become a symbol for the Dalai Lamas as temporal & spiritual rulers of a united Tibet. Goesjri Khan became "king of Tibet" and the regent "desi" or prime minister. Both often joined forces to implement Gelug policies "de manu militari". They still had to fight in Bhutan, were prominant Kagyupas remained active. Their presence shows the seed of conflict had not been removed. The Enthronement Scene is the clearest political statement of national identity possible. Without the Mongol Goesjri Khan, the Dalai Lama would not have sat there. This is another variation on the theme of suzerainity. In 1644, the former Jin, now called "Manchu", crossed the Great Wall. These non-Chinese entered Beijing and started the conquest of China, eradicating the Ming, which would take 17 years to complete. Earlier, in 1636, the East Mongols had capitulated to them and two years later they conquered Korea. Exactly like the Mongols before them, they gave their Dynasty a Chinese name "Qing", meaning "pure" and also made sure the native (Han) Chinese would not intermix with the Manchu (as had already been forbidden during the Yuan Dynasty). The only Mongol armies remaining undefeated were those of the West, like that of Goersjri Khan. This situation prompted the Manchus to take interest in the Fifth Dalai Lama, for his influence on the Mongols was well established. In 1652, a decade after the unification of Tibet, the Manchu Emperor Shunzi wrote to the Great Fifth for the third time. For the Dalai Lama this was an opportunity to finish his work : convert Tibet, Mongolia & China to Buddhism. For the Manchus, it was an opportunity to use the Dalai Lama to pacify the Mongols. But even back then, in the minds of the native Chinese (Han) advisors of the Emperor, Tibet had to be seen as a province of China ! However, Manchu documents describe Tibet as a foreign country, a territory "beyond the border" of the Great Wall. First it was decided the Emperor would meet the Dalai Lama outside the Great Wall. To consider such a possibility proves how important the Dalai Lama was. Then, to protect the Emperor, his advisors -seeing bad omens- convinced him to meet the Dalai Lama in his palace in Beijing. Note how the Manchu Emperor invited the Dalai Lama before finishing his conquest of China ! The Great Fifth was treated as the ruler of a smaller, independent nation. In Januari of the year 1653, the Emperor and the Dalai Lama greeted each other for the first time. Having tea, they decided to drink at the same time. Because Tibet was a smaller nation, the throne of the Chinese Emperor was a little higher, but the Dalai Lama sat down next to the Emperor. The political motivation of the Manchu ruler is clear : he knew the Dalai Lama was protected by the powerful army of the West Mongols and that in their eyes he was a spiritual authority. By forming an alliance with him, he hoped to assure his western borders would be secure while continuing conquering the Ming. In 1682, the Great Fifth died. Forseeing trouble, he asked the desi to keep his death secret while looking for his reincarnation. The Sixth Dalai Lama was found in 1685 and only in 1696 (when the Potala was finished) did the desi announce the Great Fifth had died 15 years earlier and that his reincarnation was 13 years old ! In 1697, Tsangyang Gyatzo became the VIth Dalai Lama. The desi who had found the boy was a Nyingmapa and he instructed the boy in Dzogchen & Tantra (involving erotical yoga). As a consequence, the VIth Dalai Lama did not want to take monastic vows and rejected those he had taken. In 1702, he decided to reject celibacy, turning against the Gelug rules. He drank beer, sang, made fun and had lots of girlfriends. Prominent Lamas and members of the royalty asked him to change his ways, but he adamantly refused. The grandchild of Goesjri Khan, Lhazang Khan, the king of Tibet, found the whole story of the hidden child insulting and rejected the desi and "his" VIth Dalai Lama. He formed an alliance with the Manchus ! In 1705, helped by his Mongols & the Manchus, he killed the desi. In 1706, the VIth Dalai Lama, due to the treason of Lhazang Khan, lost his throne. From 1706 onwards, the institution of the Dalai Lama is linked with the suzerainity of China over Tibet. In 1709, the Emperor of China dispatched his first Emperial Envoy (the amban). Lhazang Khan installed his own "VIth Dalai Lama", promptly rejected by the Tibetans. Some monks asked another fraction of the Mongols to help, and in 1717 these entered Tibet and killed Lhazang. But the VIIth Dalai Lama, who had recently been found, remained under Manchu control. In Tibet, because of these plundering Mongols, a period of violence ensued. In 1720, the Manchu army, now welcomed by the Tibetans, returned to Lhasa and remained three years. They expelled the Mongols and their Tibetan dynasty, installed Kelzang Gyatzo, the VIIth Dalai Lama, and initiated a loose Manchu protectorate (which would last 150 years). The Manchus remained interested in Tibetan Buddhism, and in 1744 Emperor Yonghegong turned his palace into a Tibetan Buddhist temple. Emperor Qialong built an enormous version of the Potala in his summer palace in Jehol. Between 1697 (the enthronement of the VIth Dalai Lama) and 1875 (the death of Trinley Gyatzo, the XIIth Dalai Lama), Tibet was ruled by regents backed by the Manchus. The VIIIth Dalai Lama was a contemplative who let the regent conduct the administration. The other Dalai Lamas died too young to effectively rule (at 14, 16, 18 & 18). According to some Western historians, these five Dalai Lamas were systematically poisoned. According to the XIVth Dalai Lama, these boys died as the result of carelessness. In both cases, this only shows how weak the institution was. Since the collapse of the Tibetan Empire (842), Tibet needed a strong military ally to pacify its internal problems. Internal conflicts between Bön & Lamaism, between the kings and the central authority, between Kagyu and Gelug, between the conservative nobility and the reformists, etc. were -if not repressed by force- ongoing. During this history, fractions, splits and geosentimental, feudal landscapes too often emerge. Without Kublai Khan, Sakya Pandita's nephew, Phagpa Gyaltsen would, in 1268, not have initiated the Sakya Dynasty, enforcing the peace in Tibet by way of Mongol military power. Between 1368 (Tibet declares to be independent from the Mongols) and 1578 (Sonam Gyatzo meets Atlan Khan), Tibet was split and hostility reigned. Without the military help of Atlan Khan, Sonam Gyatzo, the IIIth Dalai Lama, would not have succeeded in controlling the Kagyupas. Without the army of Goesjri Khan, the Great Fifth would not, in 1642, have sat on the throne of the king of Tsang, and be declared the supreme temporal & spiritual ruler of Tibet, presence (kundun) of the Buddha of Compassion, Chenrezi (Avalokiteśvara). Without Goesjri Khan's army, ordering Kagyupas to become Gelugpas would most likely not have had any effect. Without the help of the Mongols, called upon by the Tibetans, Lhazang Khan would not, in 1717, have been killed. Without the Manchus, these selfsame Mongols would not, in 1720, have been expelled, allowing the VIIth Dalai Lama to be enthroned. Apparently, between 1720 and 1897, the Tibetans fully accepted the suzerainity of the Manchu Emperor, albeit in the form of a tributary relationship in harmony with Buddhism (cf. worldly protector versus spiritual teacher). During this period, Tibet was an independent Medieval feudal state run by regents and nobility. The last chapter of this story is mixed with the colonial interests of the British Empire, in particular its North-India politics. In 1897, two years after he was enthroned, Trinley Gyatzo, the XIIIth Dalai Lama, no longer took advise from his Manchu administrators. His advisor Agvan Dorjiev (1854 - 1938) told him to look out for new powerful protectors. Maybe Nicolas II, the Tsar of Russia, could help ? Because London thought the Russians would indeed form an alliance with the Tibetans, endangering the northern border of the Indian subcontinent, and given the weak Qing Dynasty (caused by the Opium Wars led by the British earlier), they organized a small invasion army and, in 1904, entered Tibet. So in July 1904, after appointing a regent to rule Tibet in his name, the XIIIth Dalai Lama fled to Mongolia to teach Buddhism ! This may well have been his greatest blunder ! Suppose the Great XIIIth would have welcomed Lieutenant Colonel Younghusband and would have secured for himself a passage to London. There he could have made a strong, convincing deal with the British Empire, guaranteeing their northern India border. At this point in time, London only wanted to guarantee Russia would not lean too much to the subcontinent. Britain was still willing to give had the Office of the Dalai Lama effectively stepped in the Arena of World Power. However, when Francis Younghusband arrived in Lhasa, he was told the Dalai Lama was unavailable ! If the Dalai Lama had not listened to his conservative advisors, and had not given in to what they thought the British were and would do, but would have granted the Lieutenant Colonel his presence, Tibet probably could have become a protectorate and then China would have "lost" Tibet to the British Empire. Then, later, their membership to the international community could not have been refused (as it was). Because the Tibetans wanted the British troops out of Tibet, the regent signed an agreement with him, stating Tibet accepted the British annexation of Sikkim and would pay them, effectively incorporating Tibet in the British Empire. This 1904 document is the first treaty signed by Tibet in accord with European law. If Britain would have honored this agreement, Tibet would have become a protectorate like Sikkim. But without the seal of presence of the Dalai Lama, the 1904 document remained but paper. Also because the Manchus told London the Dalai Lama had only religious authority. This helped to form the false convinction the Dalai Lama was politically powerless and the 1904 treaty was without real political backing. The fact the Dalai Lama himself never met, say the British PM, to explain the situation, did not foster reliable ground. On the contrary, it merely underlined the remote, irrealistic, absent & powerless nature of the institution of the Dalai Lamas. In 1905, in defiance of the British, Chinese imperial troops led by Zhao Erfang invaded Tibet, destroying many monasteries. The Qings started to colonize East Tibet, Mongolia & Manchuria. In 1906, when the British realized Tibet was anyway too poor and too difficult to rule, they signed a treaty with the Qings, stating they would not annex Tibet, nor interfere in its government. The treaty affirmed Tibet was not outside Qing borders, while nowhere the claim was made it was part of the Qing (Manchu) Empire ! In 1907, they signed a treaty with Russia to the effect Russia would accept Chinese suzerainity over Tibet. By this dirty game, London guaranteed its northern Indian border as well as their annexation of Sikkim and the other Himalayan protectorates Nepal & Bhutan ! The result of this on Tibet no longer interested Britain ... The cricket game had moved on. At this point they considered the Dalai Lama to be politically irrelevant. He had missed the train ! The recurrent interest of China is simple : China wants to secure for itself the sources of the main rivers of Asia and these spring in Tibet ! In 1908, the XIIIth Dalai Lama left Mongolia and travelled to Beijing. He was told to prosternate before the Qing Empress, which he refused. Finally, he greeted her on his right knee ! During his stay, the Emperor Guangxu as well as the Emperess-doweger Cixi died. The last Emperor Pu Yi was enthroned and his uncle became regent. In 1909, Zhao Erfang was again dispatched to Lhasa, and he was so cruel to the Tibetans they called him "the Butcher". The XIIIth Dalai Lama, who had returned to Lhasa, realized his attempt to win the hearts of the Qings had failed, and he fled Tibet again. In March 1910, he arrived in India and studied European statemanship. In 1911, the Qing Dynasty collapsed and Sun Yixian initiated the Chinese Republic. For Sun, the Qings, who had ruled China since 1644, had been brutal (Mongol) dictators. He praised the Chinese race (the Han) and praised the Ming Dynasty, his ancestors. In June 1912, during his exile, the XIIIth Dalai Lama proclaimed the independence of Tibet. But in that same year, Sun Yixian declared China to be a multi-ethnic state, with Manchu, Mongol, Tibetan, Han and Ujgurs. For him, the Tibetan declaration of independence was a farce. In January 1913, after a popular insurrection had expelled the Chinese troops, the XIIIth Dalai Lama was back in Lhasa. In 1914, the Simla Conference was held, resulting in the "Direct Agreement between Britain and Tibet", immediately rejected by the Chinese (although the treaty recognized Chinese suzerainity over Tibet). The Simla Conference was indeed ten years too late. Things had moved on : arrived at this point in time, the Chinese Republicans rejected the treaty, considering Tibet a province of China, going back to the notion of the "Greater China". To them, the Britans had no claim whatsoever. But because of their inner divisions, these Republican Chinese could not empower their claim over Tibet. From this moment until his death in 1933, the XIIIth Dalai Lama worked to reform & modernise Tibet. But senior Lamas & high officials, sticking to "ngarlam", the "traditional way", rejected these reforms, identifying them as "British atheism". In fact, they wanted to maintain their feudal privileges. When the Dalai Lama asked the monastery of the Panchen Lama (Tashilunpo) to pay additional taxed to finance the army, the latter refused and fled to Republican China for help ! This caused the Chinese to rightly claim Tibet was again unable to settle its affairs without outside help. At the end of his life, the Great XIIIth foresaw the destruction of the monastic system in Tibet and the devastation of its land & culture. He had seen clear but much too late ! Between the end of the Qing Dynasty (1911) and the establishment of the People's Republic of China (1949), China was in turmoil. Civil war had caused enormous suffering and the matter of Tibet was temporarily suspended, although several Republican governments affirmed Tibet to be part of China. The suzerainity of China over Tibet was turned into the sovereignty of China. Then, as early as 1950, the ultra-nationalist People's Liberation Army of Mao invaded Chamdo. For those Communist, the Buddhocracy of Tibet was backward and feudal. They saw themselves as liberators, helping a people oppressed by Medieval Lamas to begin anew. As the Republicans of Tjiang Kai-sjek had claimed earlier, Tibet was deemed a province of China, and was now about to be returned to the "Mother Land". Tibetan Buddhism was the cause of its retarded economical state and barbaric system of law. At that time, the young XIVth Dalai Lama still believed Mao's Communist China could bring the necessary good reforms to Tibet. Moreover, nobody else was willing to help him (London, Paris & Washington betrayed him, while the matter of Tibet's invasion by Communist China was never put on the agenda of the UN). On the 27th of September 1954, the XIVth Dalai Lama was elected to be the Vice Chairman of the Standing Committee of the first National People's Congress. But in 1956, during his visit of India, he learned about the atrocities happening in Tibet in the name of Communism and realized the communist take on Vajrayâna Buddhism and religion in general was unacceptable. The type of Communism at work in those days had not yet come to grips with the necessity of religious consciousness, identifying such cultures as unnecessary while they are necessary and so part of the cultural existences of peoples. The Dalai Lama returned to Tibet, was bombarded in his Summer palace, and then, in 1959, after having established the Tibetan Government-in-Exile on Tibetan soil, fled to India ! There, in Dharamśala, he established his HQ and developed a vast, world-wide network, with major communities in India, Europe, the United States and all over the world. He internationalized the Office of the Dalai Lama and the presence of such a unifying personalised office benefits the Tibetan people, especially nowadays. China should totally revise its policy on this, and this is easy when less conflicts is the goal. Old Tibet, as the XIVth Dalai Lama himself insists, and history sadly confirms, was not that pure, blissful land of compassion, heaven or "Shangri-La". This is a literary and later Hollywoodian fiction based on incomplete or distorted information. After having been a vast & violent Empire, Tibet had become a Medieval, isolated feudal Buddhocracy with an appalling human rights record. There was no word for "slave" or "serf", and these people were named "nyamthag" (weak and poor) or "chabang", "poor subjects". Although precise information is lacking, Western scholars estimate 60% of the population were serfs. Half of these serfs owned land, but had to pay very heavy taxes to the nobility and/or the monasteries. About 20% were nomads and 20% monks. Criminals were systematically tortured : shackled, hands chopped off, eyes gouged out, thrown in scorpion pits, starved to death, publicly humiliated, etc. Serfs & slaves were told their unchangeable position in the cast system was the natural result of wrong actions in previous lives. To be sure of a better rebirth, this had to be willingly accepted ! etc. etc. As everywhere else, this record is dark & sinister. And all of this was still going on when the young XIVth Dalai Lama was on his throne ! It goes without saying these shameful historical facts do not condone any of the brutalities or the "cultural genocide" inflicted upon native Tibetans and their land by Communist China. If we believe the XIVth Dalai Lama, he was ready, in his lifetime, to implement all the necessary changes himself. However, critical voices rightly say this would have invited a subreptive return to an autocratic & Buddhocratic Lamaism, a system of thought which cannot be paired with contemporary scientific standards on education & human rights. In 1989, the XIVth Dalai Lama was awarded the Nobel Peace Price, which he dedicated to all beings, but particularly to the freedom of the Tibetan people. The prestige of this price gave him access to the vast funds & services available in Europe and the United States. In 2007, he received the Congressional Gold Medal from the United States. In 2008, the year Communist China hosted the Olympic Games, Time 100 declares the XIVth Dalai Lama to be Nr.1 on the list of the World's Most Influential People. But ironically, in that same year, in the context of the Dorje Shugden Affair, he stands accused in the Indian courts of being more like a "totalitarian dictator", rather than the reincarnation of the Buddha of Compassion his followers proclaims he is (he is sued for heavy-handedly persecuting followers of Dorje Shugden). Although the record of the "Great Fourteenth" is indeed remarkable, history allows us to doubt whether his Tibetan aristocrats & reincarnate Lamas would have allowed him to make the very drastic reforms needed to truly modernize Tibet. Senior Lamas and aristocrats wanted to keep their privileges and the clergy thought the Buddhas & Bodhisattvas would protect Tibet from the Communists ! These unhappy traditions & superstitions run deep. They still do. "Luminous, monks, is this mind, but it is defiled by adventitious defilements. Luminous, monks, is this mind, and it is freed from adventitious defilements." - Buddha Shâkyamuni : Ekottarâgama (Ekakanipâta, I.10, 49/9, 50/10). In this virulent conflict, two parties oppose each other. On the one hand, there is the view of those who worship "Dorje Shugden", considering this entity to be a Dharmapâla or "Dharma Protector", i.e. a Buddha with extraordinary spiritual, but also material powers ! This Supreme Being is specially dedicated to safeguard what is deemed the "purity" of the teachings of Je Tsongkhapa, the founder of the Gelug school of Tibetan Buddhism. What is this purity ? Considering the Second Turning of the Wheel of Dharma as definitive and final, and the Third Turning as mixed (provisional and definitive), but never as definitive and more profound. They resent the XIVth Dalai Lama for betraying, so they believe, his very special connection with all Gelugpas, and this by calling his followers to stop worshipping Dorje Shugden, the special protector of these teachings ! Their attack on the Dalai Lama is in : A Great Deception : The Ruling Lama's Policies, Western Shugden Society - London, 2010. On the other hand, there is the XIVth Dalai Lama, the spiritual leader of Tibetan Buddhism, who at some point stopped worshipping Dorje Shugden and advised his followers to do the same. For them, Dorje Shugden is a "demon king" or "Great Gyalpo", in particular a "gyalpo" of the region of Dol ("Dolgyal") considered to be an evil, vindictive spirit posing as a Buddha and causing harm to the Tibetan community in general, to the institution of the Dalai Lama and to the life of the XIVth Dalai Lama in particular. The Dalai Lama thereby follows the conclusions of the Great Fifth as well as the XIIIth Dalai Lama. A study dedicated to elaborate on this theme was published last year (Bultrini, 2013). Philosophically, the drama with the Shugdenites boils down to the status of the Second & Third Turning of the Wheel of Dharma. The Shugdenites are "exclusive" Rangtongpas. They only accept self-emptiness, and hold that the absence of inherently existening sensate & mental objects is the soteriological key to generate Buddhahood. To them, the Second Turning is definitive & final. Nothing more is needed. In the Rangtong view, the Third Turning is a mixed bag, calling for interpretation & guidance. Theirs is the "path of the pandit". Buddhahood is deemed possible, but Buddha-nature is merely a potential, not an actual Buddha. In Tibet of old, most Gelugpas and some Sakyas were exclusive Rangtongpas. This contrary to the Nyingmas, Kagyus, Jonangpas and some Sakyas, who saw the Second Turning & the Third Turning as respectively definitive and ultra-definitive. Accepting the self-emptiness of the original mind, they nevertheless directly experience this very subtle mind of Clear Light as empty of anything other than what it is, namely an untainted, unspoilt, free and unobstructed existence. Not a (substantial) self-existence, but a mere (differential) existential existence. How unfortunate this ideological difference has literally caused bloodshed. Shugden makes sure, if necessary by violence, that the Gelugpa teachings remain "pure", i.e. free from contamination from so-called "non-Buddhist" views. The Shugdenites adhere to the "sect" and its "fixed" canon & practices. The current Dalai Lama, a Gelugpa adhering to the non-partisan view integrating the five schools of Tibetan Buddhism, embraces the "path of the pandit", as well as the "path of the yogi". Self-emptiness clears the reification of all sensate & mental objects, whereas other-emptiness directly introduces the mere existential existence of Buddha-nature, this perfect(ed) symmetry-transformation at the root of every mind. Rangtong is philosophical, Shentong is experiential. A complementarity is at work and should be respected. It is not my intent to elaborate on all the various points of this complex conflict, restricting myself to twelve points covering my view in the matter. 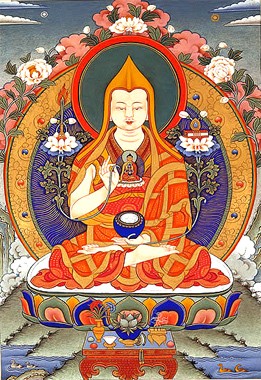 When later, the Dalai Lama, continuing the practice in the name of the "purity" of the teachings of Lama Tsongkhapa, also began to receive teachings from non-Gelug schools, he realized the worship of the sectarian, unitarist Dorje Shugden undermined his pluralist effort to (a) integrate the five schools and (b) guarantee the survival of Tibetan Buddhism as a single tradition. His integrative & pluralist non-sectarian approach became public at the beginning of the 1970s. This prompted a disciple of Trijang Rinpoche, Zemey Rinpoche, to publish The Yellow Book. It listed all the deaths and misfortunes attributed to Shugden's interventions when "corrupted" teachings were integrated in Gelugpa practices ! The Dalai Lama was alerted and decided to ritually investigate Dorje Shugden for himself, as well as to take heed of the warnings of the State Oracle. In 1996, he banned the practice of Dorje Shugden, considering him a vindictive, worldly spirit and certainly not a Buddha as his devotees claimed. 10. from the standpoint of common sense and honour it is clear the teachings of Lama Je Tsongkhapa do not need a special protector to keep them "pure". Lama Je himself received Old School teachings and some of his teachers were Jonangpas (thus accepting Other Emptiness and teaching Ati-Yoga). 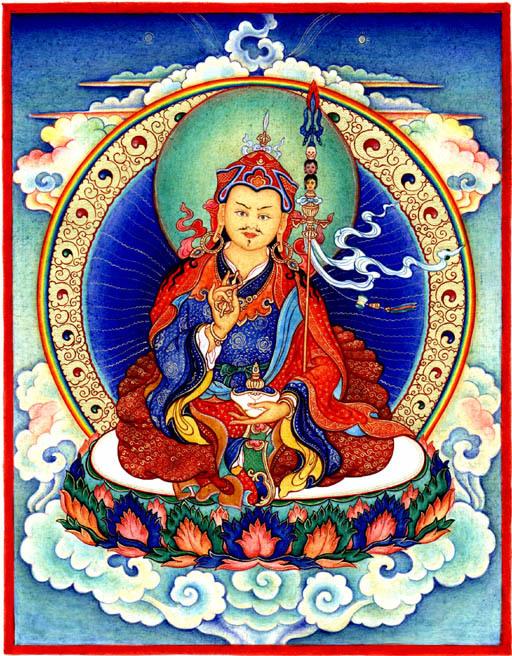 According to Lama Yeshe, Lama Je was the reincarnation of the founder of the Old School, Guru Rinpoche ! 11. the XIVth Dalai Lama has no "legal" power to stop the worship of Dorje Shugden, but he is called to advise his disciples. The fact he stopped worshipping Dorje Shugden is indeed proof he thinks some of his teachers were wrong in this respect and he is totally entitled to do so. The fact he did, proves even an excellent mind like that of the Dalai Lama knows spiritual process, and this is a kind way to teach. It is a call to every individual practitioner. Be a light unto thyself ! Lord Buddha told us to test every teachings, including those given by Buddha himself ! Sectarian views, like nationalisms and worse, territorialism, are outdated and dangerous, and so one is correct in rejecting this worship on philosophical grounds alone. What is this "impurity" Lama Je's teachings needs to be protected from, if not the folly of our own minds ? 12. as to the occult nature of Dorje Shugden, the Nyingmapa Terdak Lingpa, who did the rituals to clear the negative forces assailing the Great Fifth after Drakpa's death, Dolgyal was not Drakpa Gyaltsen, but the incarnation of a Karmapa monk who had malevolent intentions rooted in a sectarian outlook (Bultrini, 2013, p.237). The Great Fifth said it was a very powerful and perfidious spirit (a "dam-sri" or perpetrator of harmful actions). He added it was born from distorted prayers harmful to the Buddhadharma and to sentient beings at large. The XIIIth Dalai Lama agrees, so does the XIVth Dalai Lama. Wherever this spirit appears, the lineage, work and statues of Padmasambhâva come under attack. Indeed, the Old Translation School (Nyingma) is the main target of this violent entity. Although in an Autonomous Tibetan Region part of China, Tibetan culture (writing, education, religion etc.) should be free, this should not prompt a return to the neo-feudal system of Buddhocratic rule or any form of religious intolerance. Given the autocratic stance of Lamaism and ingrained cultural habits, these matters are to be taken seriously. Unlike many exile movements, the problem is not in the first place their leader, centralizing all lineages in his own person, but with the very conservative popular opinions of common Tibetans, often condoned (if not stimulated) by some senior Lamas. Moreover, combining political & spiritual power always leads to abuse. The Office of the Dalai Lama is not exempt of this historical fact. Claiming to be a democrat without stimulating the advent of a critical opposition, is like trying to boil water without heat. In the mid-1970s, the XIVth Dalai Lama, very much aware of the perils of his own institution, told a Polish reporter the following : "The Dalai Lama office was an institution created to benefit others. It is possible that it will soon have outlived its usefulness." (quoted in Verhaegen, A. : "The Dalai Lamas : The Institution and Its History. Emerging Perceptions", in : Buddhist Studies, Printworld - New Delhi, n°15, 2002, p.5). The conservative Tibetan Lamas and aristocrats-in-exile responded by saying that since the Dalai Lama is a national institution, it was up to the people of Tibet to decide whether or not the Dalai Lama should reincarnate ! On the 15th of March 2011, the Tibetan Cabinet accepted the Dalai Lama’s decision to retire as the political head of the exiled Tibetan government. The Dalai Lama's government-in-exile is not recognised by any country, including India. XIV : an exceptional figure, but banned from Tibet, internationalizing the person of the Dalai Lama and promoting an integrated, pluralist, non-sectarian take on the whole of Tibetan Buddhism and Buddhism at large. This record shows the institution never properly worked without the help of the Mongols, the Manchus or, recently, the international community (before the mid-1970s, the Free Tibet movement was funded by the Central Intelligence Agency of the USA and via NGO's money continued to flow, even directly into the pockets of the XIVth Dalai Lama). However, let us recall not a single country in the world, nor the UN, accepts -despite the constant lobbying of the "Great XIVth" and his countless devotees & admirers- the Tibetan "government" in exile. Apparently, the institution of the Dalai Lama always seeks strong protectors to back its activities. Moreover, of the 14 Dalai Lamas, only three (the Vth, the XIIIth & the XIVth) really made a difference. And unlike hereditary dynasties, the tulku-system is more open to abuse and manipulation (the Dorje Shugden issue is a spirito-political dispute concerning the choice of the Vth Dalai Lama !). Let us recall the Bodhisattva Gautama, son of a chieftain, fled politics in the middle of the night. As a Buddha, he never practiced integrating politics & spirituality. Was the institution of the Dalai Lama a failure ? The XIVth Dalai Lama is right when he claims the question of Tibet is not about the institution of the Dalai Lama or his return to Tibet, but about the life & culture of the 6 million Tibetans of today. He also thinks Tibet (although truly independent in 1950) should relinquish this independence, remaining part of China (his "Middle Way" approach). Lots of frustrated young Tibetans disagree with him on this, but agree to let him finish his work. Cultural autonomy and a special kind of selfrule should be given in accord with the Chinese Constitution, so the Dalai Lama says, while -in theory- democracy and human rights remain his top priorities. He suggests an international commission of experts should look into the matter and agrees the secular principle separating State and Church is valid (although the buddhocratic homogeneity sought suggests otherwise). He confirms China brought material prosperity to Tibet, but demands cultural autonomy for the Tibetans. Tibetan Buddhism is part of this culture. But can it be divorced from its traditional authoritarian, sectarian and other obvious shadow elements advanced by his, at times, vitriolic critics ? "The way schools are organized in the Tibetan community in exile, with mandatory prayers and portraits of the Dalai Lama in every classroom, frighteningly suggests a major step backward for education in Tibet. The Dalai Lama's contradictions and constant reversals from one day to the next are destroying his credibility. If he hopes to be believed, he must make stronger commitments, contractualize them and dissolve his 'government', and organization in which half (3 out of 6) of his cabinet are family members and other relatives hold positions at various levels in the Parliament and entities responsible for foreign affairs." - Vivas (2012, p.113). Can critical political education of the Tibetans be forthcoming ? Can the "political master-plan" of the Buddha of Compassion contain errors ? Is the "divine" Dalai Lama able to make mistakes ? Can a truly liberal system of democracy see the light ? Is the Dalai Lama always above all other Tibetan leaders ? Is his status irrefutable and beyond criticism ? Is a rational policy possible, or is the Dalai Lama, being a Buddha, per definition always right ? Are irrational traditions more important than rational approaches ? Is he more gifted than any other to develop political policies ? Can the political & religious status of the Dalai Lama be combined ? Is the mythical narrative of the Dalai Lama more important than the rational truth of liberal authority ? Is the spiritual "lottery" of choosing a Dalai Lama essential ? Can the Dalai Lama truly "retire" and remain the Dalai Lama ? Can the current Tibetan government be called "democratic" without true party politics ? Why has, after 50 years of exile, the political mentalities of the Tibetans not really changed ? Was education bad or lacking ? Why ? Can the institution of the Dalai Lama be maintained hand in hand without the traditional reincarnation-system ? Is the Dalai Lama's definition of "autonomy" not another form of "independence" ? Is the supposed "divine wisdom" of the Dalai Lama to supersede liberal & rational choices ? "... although this book has absolutely no empathy for the Dalai Lama as an underhanded political leader, it is not a pamphlet against Buddhism. Rather, it laments the way in which Buddhism has been twisted for purposes that we would be astonished (and terribly sadened) to find enshrined in an immortal sacred text." - Vivas (2012, p.119). Due to the work of the Great XIVth, the person of the Dalai Lama has become an international reality the invested powers no longer deny, be they individuals, nations or international assemblies. He has achieved a status no Dalai Lama before him ever had. China's opposition largely contributed to this fame. The culture of Tibet and the institution of the Dalai Lama are interconnected. At this point, as is in many other countries on the planet, the mindset of the masses is clearly helped by this institution, representing a unity otherwise lost. Of course, constant reforms are necessary, for like all other things, this institution is impermanent and so constantly changing. For this reason Tibetans pray the Great Fourteenth to return as the XVth Dalai Lama ! This is also in China's best long term interests. Philosophically, the drama between the XIVth Dalai Lama and the Chinese Communist Party (CCP), is the fact Mao Zedong and the Communist Party adhered to an exclusivist materialism, considering religious-based political power as inferior & "to be re-educated". Let us recall Mao Zedong, for the official ideology initiated by the Party, took from Marxism & Leninism three crucial components : historical materialism, dialectical materialism and the vision of a final communist utopia. The latter cannot be achieved by way of blending religion & politics. These are the guiding principles for the Chinese Communist State. Are they set in granit ? Neo-Marxism and contemporary socialist thinking is inclined to accept matter next to information and consciousness, forming the cybernetic triad of hardware, software & userware. Historical materialism is the view making the mode of production determine all social & political structures of any society. By enlarging the set of "modes of production", information-based & sentience-based interactions produce a negentropic surplus no exclusive materialist view could. Because three independent variables are at work, chaos cannot be excluded and higher-order systems remain invited. Historical materialism must slowly be replaced by historical experientialism. Dialectical materialism views the dynamic of fundamental social & political change generated by the fundamental contradictions between property systems and modes of production. An analysis of these systems & modes in the light of quantum mechanics, cosmology, biology, cybernetics and the science of mind may reveal other categories of determination than the conflictual, as well as objectify the presence of other fundamental ontological categories besides matter. While matter (hardware) remains a crucial cosmic operator, information (software) and consciousness (userware) are also identified & made functional. Dialectical materialism is far too limited to accommodate the hypermodernism of our times. It should be replaced by Process Organicism. Politically, the vision of a global utopia prevails. Ontologically, both historical & dialectical materialism are reduced to an axiomatic ad hoc choice for the monism of materialism. For reasons explained elsewhere (Knowledge, 1995, The Rules of the Game of True Knowing, 1999, Clearings : On Critical Epistemology, 2006, Intelligent Wisdom : from Myth to Nondual Thought, 2007, Neurophilosophy of Sensation, 2007, Criticosynthesis, 2008, A Philosophy of the Mind and Its Brain, 2007 & Critique of a Metaphysics of Process, 2010 - 2012), exclusive materialism (as well as excessive or fundamentalist mentalism) is flawed, for anticipating a substance-view, rather than a process-view. In fundamental physics, all states, originating from the Big Bang singularity, are interconnected, entangled. Information is the set of all codes, but also the "code of light & life". The capacity to choose between encoded states of matter makes consciousness a non-reducible cosmic operator. Instead of a monism of singularity, we need unity in plurality, a process instead of a substance, etc. Religion, the individual communicating with the Divine, is a direct, immediate, first-person experience, but its multiple organizations or "religions", including their politics, are second-hand and third-hand cultural forms. They need time & profound wisdom to, if necessary, transform. Such important changes are never properly achieved by brute violence or repression. If matter it to interact with information & consciousness, then more will be needed, to realize the global peace of Project Fairness, than mere states of matter. Then we need the revision of information and the awakening of sentience. Many times the XIVth Dalai Lama has confirmed the importance of matter, but never without also pointing to mind, heart and emotions. As an exclusivism, materialism is in conflict with the Buddhadharma. Note that while every prayer in Tibetan Buddhism ends by dedicating it to the welfare of all sentient beings, for centuries monastics sustained a Buddhocracy run by an elitist minority ! Keep this in mind. While Tibetan Buddhism, as the keeper of the whole Buddhadharma, and as a spiritual training purged from authoritarian policies clearly benefits the individual and genuine spiritual communities, Lamaism & Dalai Lamaism, as political systems, cannot be said to work. Only just & caring democratic systems, integrating conflict & opposition in a constructive, peaceful way, guarantee the spiritual freedom of the individual. But this ideal cannot be implemented from above. It grows from the roots up. Like Kings, Queens & Popes, the Institution of the Dalai Lama and the lineage of Gyatzo are a historical fact. To relinquish such an integrative, over-arching, representative office, given the situation of Tibetans in the world, is most likely not in the best interests of the Tibetan people. Given the tulku-system is the historical format here, the succession rules must be played out without political interference, while documenting the procedures is no doubt necessary. Vajra Gurus like the XIVth Dalai Lama are said to inform where they will take rebirth. For the moment we know the Great Fourteenth will not be reborn in China, but he may of course always change his mind ! Recently he remarked the institution of the Dalai Lama had its best time. On the 17th of December 2014, he told the BBC he may be the last Dalai Lama ! "... combining religion and government adds nothing to either, but instead destroys the serenity and credibility of both." - Vivas (2012, p.118). Buddhocracy proves to be as dangerous as theocracy. There is no coercion in religion.